Nimble, a social contact relationship management service, today launched a new version of its platform designed to help people keep in touch with their business connections in a “deeper and more personal” way. This new product offers a new ‘Today’ screen to display contact updates happening that day, smart filtering to help search for people, and an improved library of supported apps in its marketplace. For most business professionals, navigating through emails and news feeds in order to keep track of what’s happening with connections can be difficult. With a deluge of information thrust at us every day, it’s a challenge to monitor what people have posted on Twitter, Facebook, LinkedIn, Google+, or any other social network. What if they’re talking about your brand or product? Acting as a digital rolodex in the social world, Nimble aims to help decongest our lives by consolidating all of our contacts and communications into one repository. As company founder and CEO Jon Ferrara tells us, relationships are critical to a business’s success. 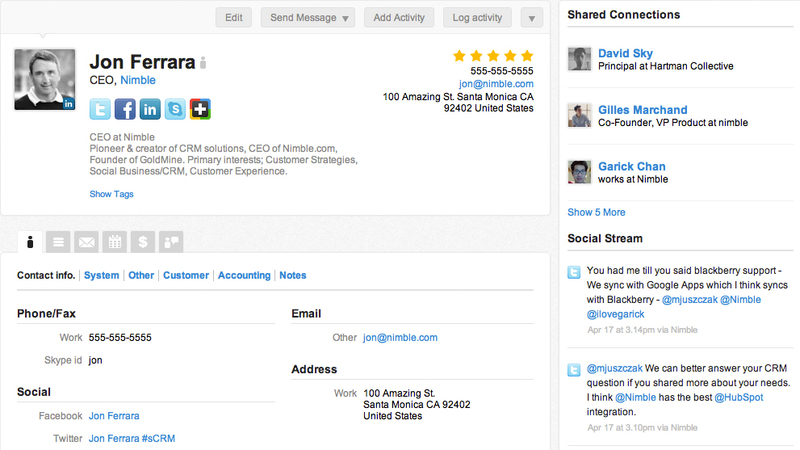 Nimble will take a “one-dimensional email” and turn it into a record of activity. Once uploaded, the system will extrapolate all the communications between the two parties, especially those where a particular brand is mentioned. It will display when that person was last contacted and help users stay top-of-mind with those people most important to them. The hallmark of Nimble 3.0 is its ‘Today’ screen. Functioning as the new service homepage, once logged in, users will be displayed information about their contacts that are relevant to that day. This includes to-do lists, birthdays, job changes, business deals in the pipeline, engagement opportunities specific to a user’s network, and more. Think about ‘Today’ as being a daily newsletter that displays action items to help build better bonds with contacts. 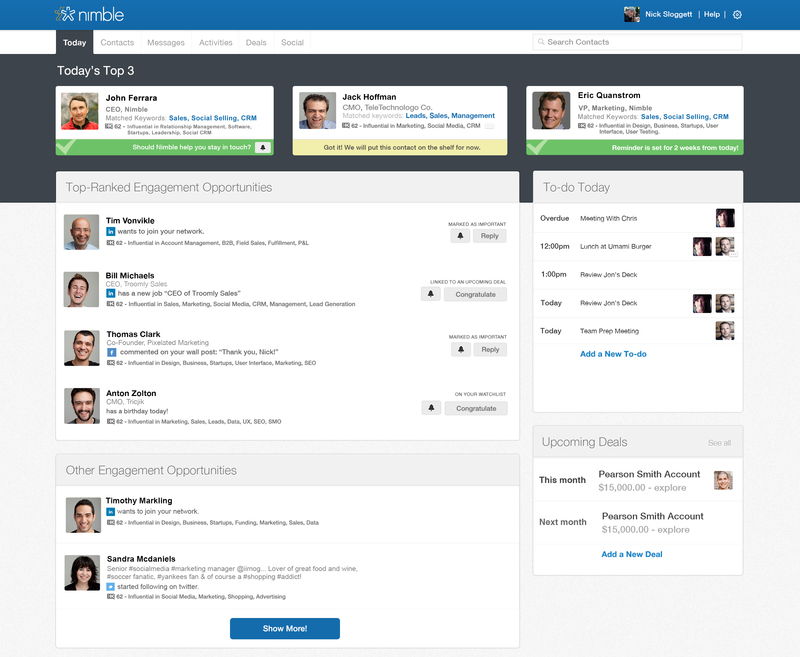 Nimble’s ‘Today’ screen is actually an integration of the company’s Nimble Daily emails. This feature was also released in beta last April. Ferrara says the difference between what is shown in the Daily emails versus in ‘Today’ has to do with what’s popular and what’s “sticky and useful”. With the emails, Nimble helps surface people that are important. But using ‘Today’, it displays the top people in a user’s social graph, looking at areas of influence and utilizing the right signals to find actionable information without needing to sort through multiple sites. Other updates to Nimble include the introduction of so-called smart signals. The service now allows users to sort their contacts based on different levels of engagement, like birthdays, job changes, if a contact is a new connection, and even social actions like Tweets, mentions, comments, and Likes. The company says that by integrating signals from Twitter, LinkedIn, and Facebook, better relationships can be built. The search capability has also been improved so that users can find relevant contacts based on a group or tag. Additionally, it will sort lists by when they were last contacted. If you have a list of people from, say, a business association, and you’re interested in finding out who the last one you spoke with, Nimble says it can show you that result. It believes it can help users learn who they are losing touch with or which people have been neglected. It’s probably not hard to believe that a service that manages contacts would be highly sought after to integrate with third-party apps. In November 2012, the company launched its App Marketplace as a means to extend its functionality. At the time, it was a very sparse marketplace, promoting services like Wufoo, Hubspot, and Rapportive. Others were planned, including Hoottsuite, Zapier, Freshdesk, Quoteroller, and Web Scribble. With today’s update, Ferrara says there are more than 100 applications supported and includes new services like MailChimp, ExactTarget, Constant Contact, Vertical Response, Act-On, and Netsuite. Nimble 3.0 may be a major update for the company, but there may be some who associate it as being similar to LinkedIn Contacts, which launched in April as a way to also foster relationships with the right people. In LinkedIn’s case, the professional social network leveraged Connected, a company it acquired in 2011 and is used on both the Web and a standalone iOS app. Ferrara acknowledged the similarities but believes that the difference between Nimble and LinkedIn rests in the scope of the connections. His company looks at multiple networks besides LinkedIn. It pulls in data from many of the major services and also a user’s email and calendar. The new version of Nimble is available today for all users and is priced at $15 per user per month, which is the cost for the company’s business plan. A standalone iOS application is in the works and Ferrara tells us that it will be coming in the next month. Currently, it’s only available on the Web, which may have some a tad disappointed because the essence of a digital rolodex only works if it’s available across multiple platforms — I, for one, would love to have an option to look at my contacts no matter where I’m at while also not having to worry about whether their information is in my email, on a business card, stored in LinkedIn, or any other service. Nimble has raised $3 million in venture funding from Google Ventures, Mark Cuban, Jason Calacanis, Don Dodge, and Dharmesh Shah.